Galactic Calendars now on Holiday Sale: $13.20! Give the Gift of Galactic Time! NEW Time is Art Bumperstickers! Sacred Symbol / Glyph Pendants! NOW ON SALE ONLY $22! Buy 3, Get 1 FREE! 4 Calendars only $39.60! 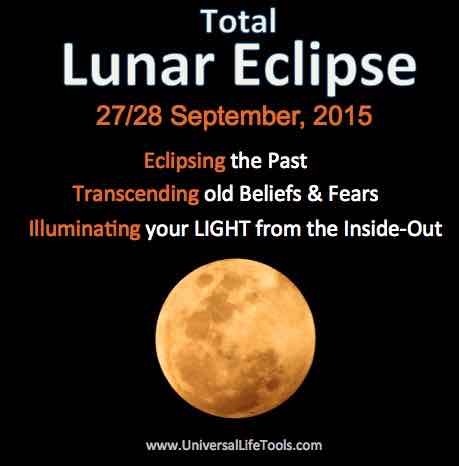 New Galactic Cycle: Oct 18 – Nov 14 ~ Owl Moon of Form ~ Time to See * Clarify * Define! On The Galactic Calendar, we just entered a new 28-day cycle called the Self-Existing Owl Moon of Form, spanning Oct 18 – Nov 14th. The key words that embody the energies available to us during this cycle are: DEFINE ~ MEASURE ~ FORM. Contemplate these code words with your own intuition to see what guidance and inspiration they have to offer to your life… Reflect upon the FORM of your life, your body, your world…This is the time to clarify, discern, and focus on how to bring coherency and structure to the foundation of your life. As the 4th month of the Galactic Year – this cycle embodies the 4th Tone of Creation “Self-Existing” which corresponds to the 4 elements, the 4 directions, the 4 seasons, the 4 limbs of our body, etc. Use these energies to bring grounding to your life by defining, getting specific, and assessing where you’re at and where you’re going – so you can formulate clear plans! While this cycle is a time of stabilizing our grounding, it is also the OWL Moon. Owls possess superior senses of sight, hearing, & silent, stealth flight. 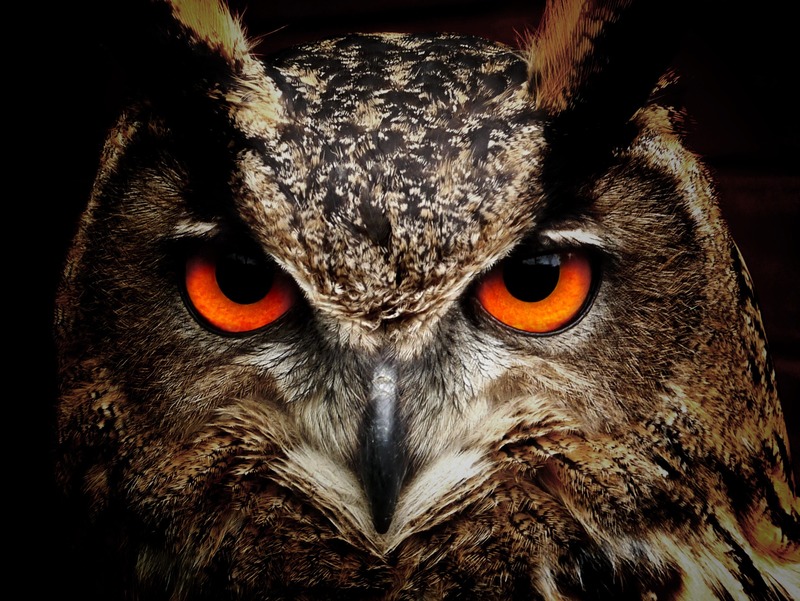 Owl totem wisdom shares: “The owl sees in the dark: As a spirit animal, the owl guides you to see beyond the veil of deception and illusion; it helps see what’s kept hidden. It also symbolizes the ability to cut through illusions and beyond deceiving appearances into the true reality of a situation or a person’s motives. The owl spirit animal is emblematic of a deep connection with wisdom and intuitive knowledge. When the owl is one of your power animals, you can access information and wisdom that’s usually hidden to most. 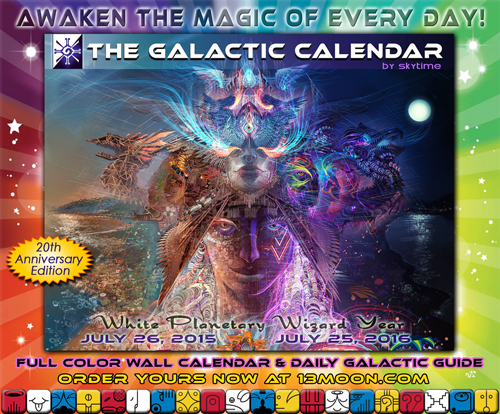 ORDER A GALACTIC CALENDAR AND STAY IN SYNC WITH THE MAGIC OF EVERY DAY! Proudly printed on 100% post-consumer recycled paper! ORDER YOUR GALACTIC CALENDAR HERE! On The Galactic Calendar, the Year is mapped as 13 months, each 28-days long. This is the ancient and harmonic way to measure our orbit around the Sun. The 13 months/moons correlate to the 13 Galactic Tones of Creation. Each 28-day cycle has a unique Tone, and a unique focus. This Moon of Form is synchronized with Tone 4 ~ The Self-Existing Tone of Form. The Self-Existing Moon of Form is always the 4th month of The Galactic Year that begins on July 26. Rather than our typical Jan-Dec reference points for our orbit around our Sun, the Galactic Calendar correlates the months to distinct qualities of Nature’s unfolding creative process, putting us in sync with our own creative potential as instruments of nature’s intelligence. In this time system, each of the 13 months of the year provide us with personal & collective focus to unify us with inspiration and meaning as we journey together in time. Galactic Time Update: Beginning Sept 20 ~ Activate Your Service! Live from Your Heart! Tune in to the Equinox! 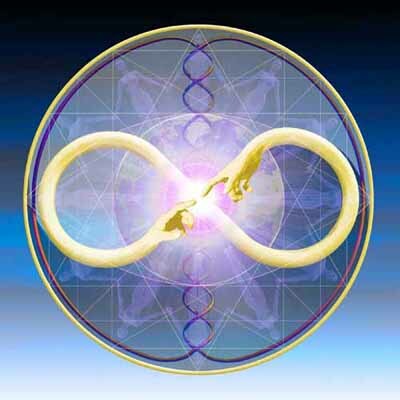 We are now embarking upon a time of potent energies that call us to Activate Our Service, Live from our Hearts, and Consciously Connect ourselves to our Planet, our Universe, and the One Web of Life. 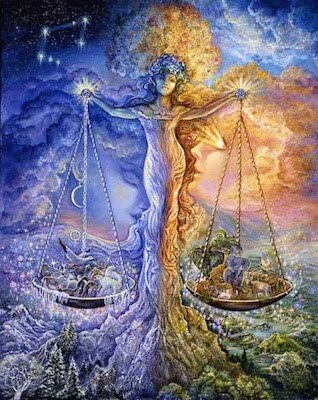 We affirm that Time is our creative life-force, and we can tune in to the magical harmonies of Galactic Time to uplift and synchronize our daily lives with the greater Cosmic order! On the Galactic Calendar, we are now initiating 2 simultaneous Galactic Cycles! We are also simultaneously beginning a 13-day cycle known as The White Dog Wavespell, focused on the energies LOVE ~ HEART ~ LOYALTY (spanning Sept 20 – Oct 2). Again, each of these code words are meant to be meditated upon by your own intuition to access their deepest meaning for your lives. Let us be reminded that our hearts are naturally attuned to the interconnectedness of all of life and naturally seek to live in harmony. Our hearts are the guides of our true evolution. How can we more fully live from our hearts? How can we commit to loving ourselves more deeply that we can offer more love to our Relations? How do our hearts wish to express their truths and their gifts in Service? The EQUINOX occurs on Sept 23 at 1:22 AM PDT, which is Red Self-Existing Skywalker Day on the Galactic Calendar. This Natural Time Holy-day is a potent time to connect with the living consciousness of our Earth in her cyclic dance of rhythmic balance with the Sun, and to open ourselves to her living wisdom to guide our own rhythms as we too seek balance in so many ways. At this time of equilibrium, the light and dark, yang and yin forces are balanced, opening opportunities to integrate these polarities within ourselves, meeting our wholeness. 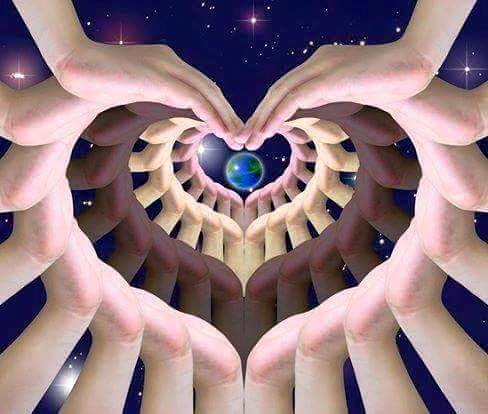 Likewise, this is a highly charged time to consciously unify our hearts and minds with our human family as we seek to contribute to the positive transformation of our shared world. The days leading up to the Equinox are being activated with Global Synchronizations for Peace (Sept 19-21) via Unify.org, culminating on the UN International Day of Peace observed around the world on September 21. There are many focused meditations, prayers, ceremonies and celebrations around the Globe during this Equinox window, including the exact time of Equinox, as well as Sunrise & Sunset of that day. Learn more here. Please join in and add the ray of your soul to this time of collective communion. 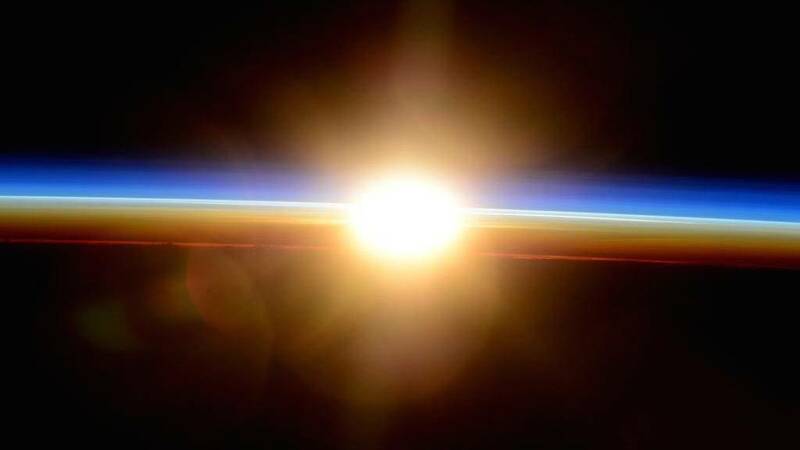 As we Unify our focus on our connectivity with each other and our Planet, we exponentially call more and more Light to our Earth, and to our shared journey. On Sept 27, Red Galactic Earth Day we will have a Full Moon/Total Lunar Eclipse that begins at 7:11 pm PDT, and peaks at 7:51 pm PDT. THE GALACTIC CALENDARS ARE NOW ON EQUINOX SPECIAL! 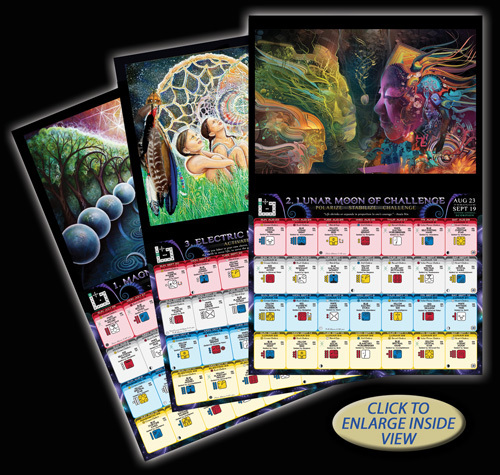 ORDER YOUR GALACTIC CALENDAR ON EQUINOX SALE HERE! “Thank you for providing this incredible medium! “This year’s calendar is supercalifragilisticexpealidocious! Wonderful! I am really enjoying it.” -Love from JAPAN! On The Galactic Calendar, the Year is mapped as 13 months, each 28-days long. This is the ancient and harmonic way to measure our orbit around the Sun. The 13 months/moons correlate to the 13 Galactic Tones of Creation. Each 28-day cycle has a unique Tone, and a unique focus. This Moon of Service is synchronized with Tone 3 ~ The Electric Tone of Service. The Electric Moon of Service is always the 3rd month of The Galactic Year that begins on July 26. Rather than our typical Jan-Dec reference points for our orbit around our Sun, the Galactic Calendar correlates the months to distinct qualities of Nature’s unfolding creative process, putting us in sync with our own creative potential as instruments of nature’s intelligence. In this time system, each of the 13 months of the year provide us with personal & collective focus to unify us with inspiration and meaning as we journey together in time. On The Galactic Calendar, every 13 days we begin a new cycle that gives us a new focus! This is a time to target what you wish to grow in your life. This is a time to discern and clarify. 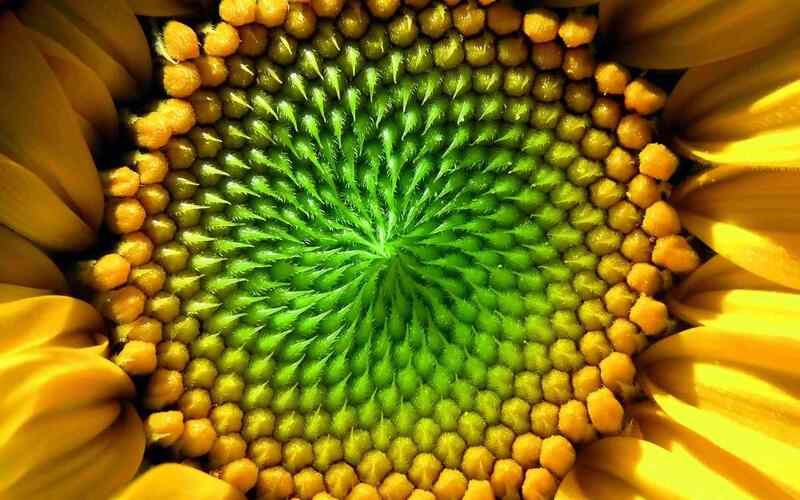 The teaching of Yellow Seed is that our lives are gardens that require intention and mindfulness. Our opportunity is to deepen our awareness and look at what the current state of our lives is. Ask yourself – What aspects of my life are calling for attention? How is my garden growing? We all know that there are many elements which contribute to a healthy garden. This is the time to ask yourself – What seeds do I want to plant in my life? What needs to be watered? What needs more light? What needs more space? How can I strengthen my roots? What weeds need to be pulled? What needs to be composted? What is ready to be harvested and shared? Yellow Seed reminds us that every moment is ripe with potential. 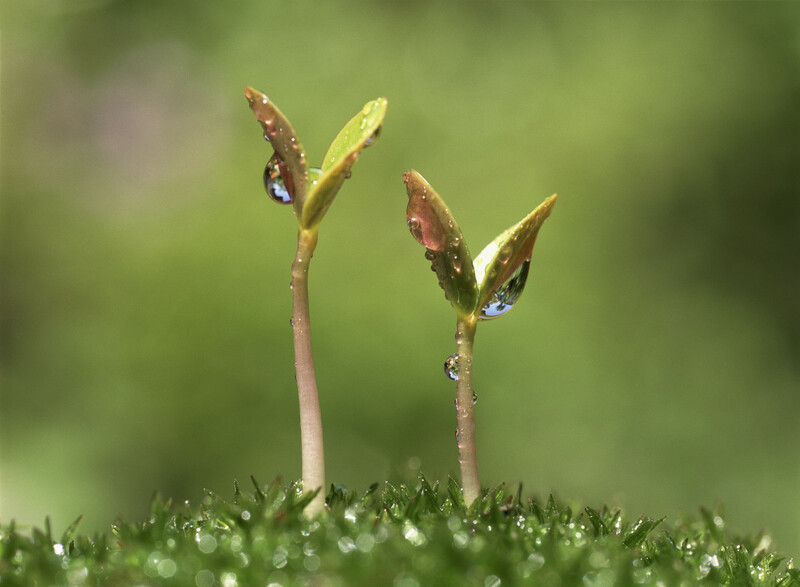 We are empowered when we realize that every thought, belief, attitude, revelation, insight, awareness, inspiration, word and action is a living seed. Activate the power of these 13 days by realizing that you are a Seed that has a unique divine encodement of your own inherent potential. Focus on nurturing the flowering of your own unfolding. Ask yourself – What is my body calling for? What is my spirit yearning for? What are my relationships inviting of me? How can I elevate the quality of my work in the world? With the Galactic Calendar, every 13 days has a new focus. These 13-day cycles are based on the 13 Galactic Tones which reflect Nature’s creative process. Check out the Galactic Calendar and be amazed at how your life can be inspired by these harmonic rhythms! We have been publishing these for 20 years, and the magic continues day upon day! CHECK OUT THE GALACTIC CALENDARS FOR THE PLANETARY WIZARD YEAR! The Guiding codes of this 1st month are: UNIFY ~ ATTRACT ~ PURPOSE. 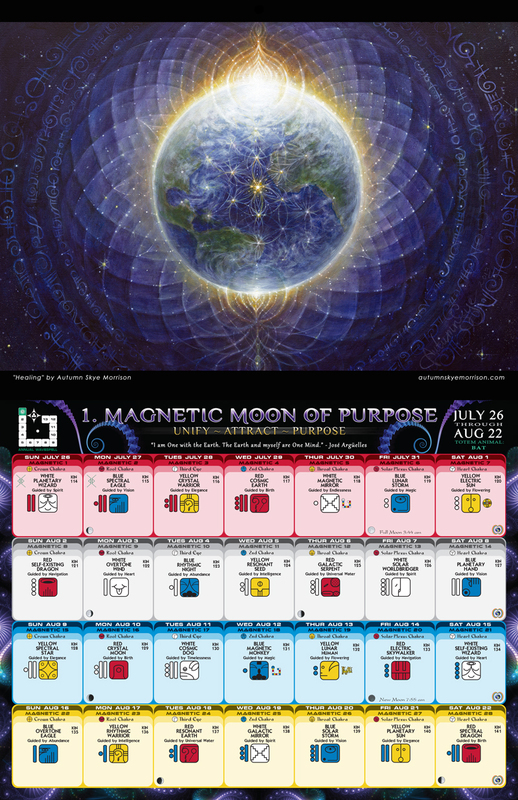 You can access the energies of this 28-day cycle by contemplating each of these 3 key words deeply within your own consciousness – travel into them for insight into how to align your life with the power of this Magnetic Moon! In The Galactic Calendar, the artwork featured in every month is a portal that tunes us into the specific vibrations of each 28-day cycle. For this Moon of Purpose we are now in, we are honored to be featuring the stunning art of Autumn Skye Morrison entitled “Healing” (shown below). 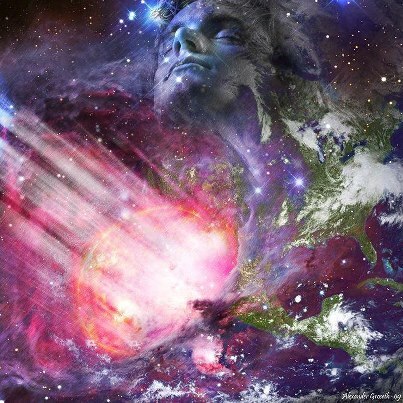 One of the most profound aspects of following the Galactic Calendar is that it synchronizes our global consciousness. With thousands of people, all over the world, focusing on this prayer together, we are amplifying the collective intent of our hearts and minds. In this way, we are the Earth Wizards helping to re-enchant the world! Having just started a New Galactic year, The Moon of Purpose is a time of renewal and introspection that calls us to bring deeper consciousness to how we are walking upon our life’s path. Ask yourself – what is my purpose, right now? And what is my vision for my potential in this new year? You may or may not have the full answers or the whole picture, but by asking these questions of your deepest self, you can receive clues and opportunities in your unfolding. This is a time to ATTRACT what you need and desire in your life in order to be whole and fulfilled, so that you may serve life with joy and be the passionate, inspired being that is your True Self. Be MAGNETIC! 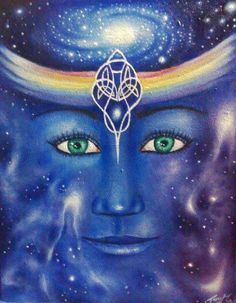 As we each seek to live aligned with our own inner calling, we are giving that aspiration and actualization to the larger Planetary Oneness. 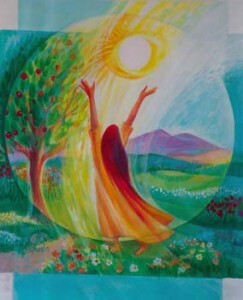 We are emanating our own ray of light that feeds into the web of light embracing our Earth. As we live our unique purpose, we are part of a larger purpose unfolding. 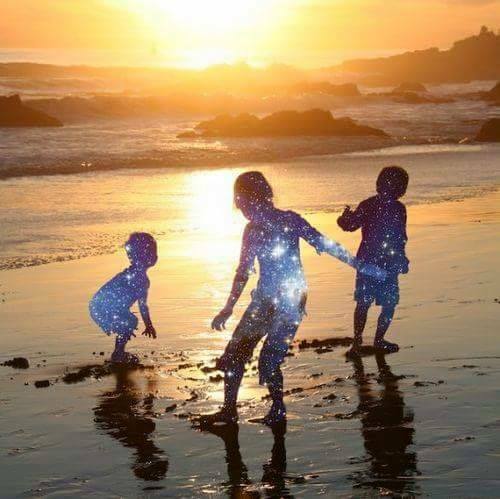 For our human family is continually awakening to our interconnectedness, and ever-learning how to bring the conscience of our hearts in union with our mind and actions. Day by day, as we continue evolving how we play the unique instruments of our lives, we can contribute ever-more consciously to the Grand Planetary symphony. Let us never underestimate what we are giving to the planet by being aware of our interdependence; by caring; by authentically showing up for our relationships; by following our inspirations; by being creative; by listening; by forgiving; by growing; by continuing to educate ourselves how we can increase the sustainability of our lifestyles; by letting go, yet never giving up; by unifying the physical and spiritual dimensions of our shared life. In reflecting upon the vast sufferings upon this planet, may we be freed of the despair of powerlessness, and may we be shown how to humbly and sincerely do our part to bring light and healing to our own bodies, our homes, our relations, our service, our communities, our world. Day by day, may we be shown how to be our authentic essence-selves that we may manifest the highest good of our lifetimes. 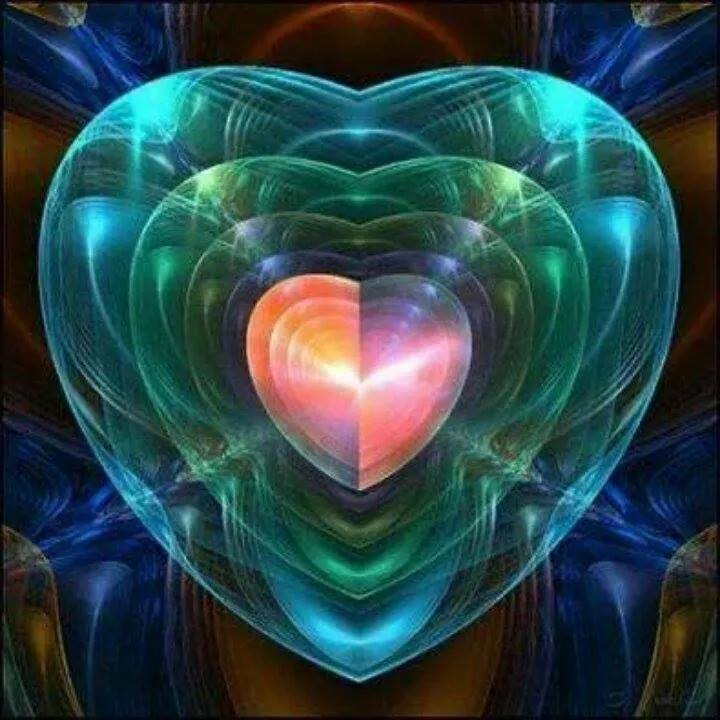 May we feel the light of our own hearts pulsing in concert with the light that dwells in the core of the one family of life, unified with the one universal light. May we take strength in feeling our connection to all beings across this world who care deeply for life, and who know that Compassion, Courage, Truth, Justice, Forgiveness, Faith, Wisdom and Love are the Medicine of these Times… May we stand together, firm in our places, as Guardians of Life. Left: Known as the “Blue Marble,” this iconic photo of the whole Earth was taken Dec. 7, 1972, by astronauts aboard the Apollo 17 mission as it traveled toward the moon, from 28,000 miles away. Right: Our Earth now, seen from a distance of one million miles captured by a NASA scientific camera aboard the Deep Space Climate Observatory spacecraft on July 6, 2015. On July 20th, 2015 (Kin 108), for the first time in over 4 decades, NASA released a NEW photo of the entire sunlit side of Earth—the first since the original Blue Marble photo in 1972. 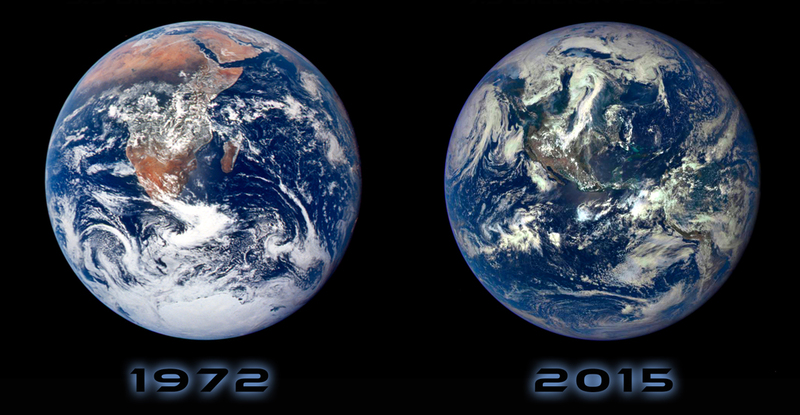 NASA has released several similar images of Earth since then, but they were stitched together from multiple photos taken at different times. Unlike those, this new photo captured the planet’s sunny side at one moment. The release of this new photo feels like a positive omen for humanity, inviting us all to take a new look at our Planet, and a new look inside ourselves… We are undoubtedly moving forward together, more consciously connected as a global community than ever before in history! 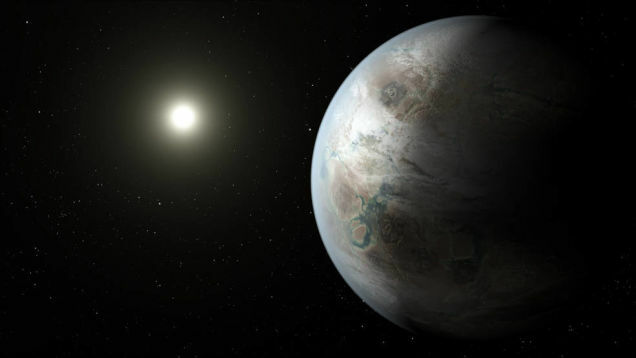 AND JUST TO MAKE THINGS EVEN MORE INTERESTING, on July 23, just 3 days after they released the new Earth photograph, NASA announced they have identified a “close cousin” to Earth that’s orbiting a sun-like star and might harbor life. “It is the closest thing that we have to another place that somebody else might call home,” said Jon Jenkins from NASA. What makes this planet remarkable is that it orbits its star at about the same distance that Earth orbits the sun. What’s more, its home star looks to be similar to our sun. It is about 6 billion years old, 1.5 billion years older than Earth, and 60 percent larger in diameter than our home planet. Its star, Kepler 452, is also older and bigger, as well as brighter than our sun. WATCH VIDE0 FROM NASA describing how they found this planet beyond the solar system that is similar to Earth using the powerful Kepler telescope. This news certainly broadens the horizons of our collective consciousness! Seeing with the Heart of a Planetary Wizard! On The Galactic Calendar, the Year is mapped as 13 months, each 28-days long. This is the ancient and harmonic way to measure our orbit around the Sun. The 13 months/moons correlate to the 13 Galactic Tones of Creation. Each 28-day cycle has a unique Tone, and a unique focus. This Moon of Purpose is synchronized with Tone 1 ~ The Magnetic Tone of Purpose. “We live in initiatory times when each soul can feel more isolated amidst the dying breath of one world and uncertain about the umbilical pulsing of the next. As I write this, we are exactly 3 weeks from the upcoming Solstice December 21, 9:47 am PST, Yellow Solar Human Day, which will mark the 3 year synchronization point with Solstice 2012. 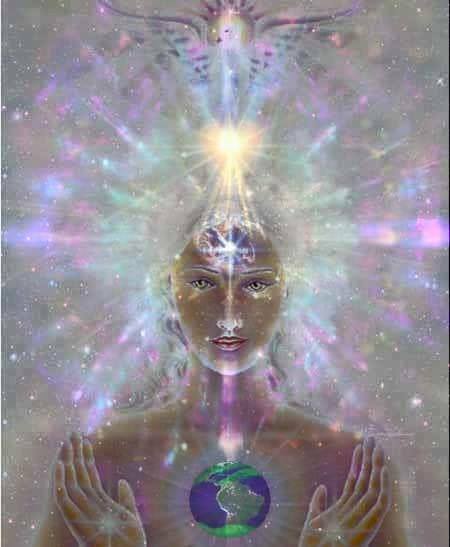 I am writing to each of you to invite us to unify our prayers and ceremonies on this holy day, aligning together as human instruments of the intelligence of the One Heart, open to the Pulsations of our Sun Star, and all the Guiding Forces that are here to help us in these times. 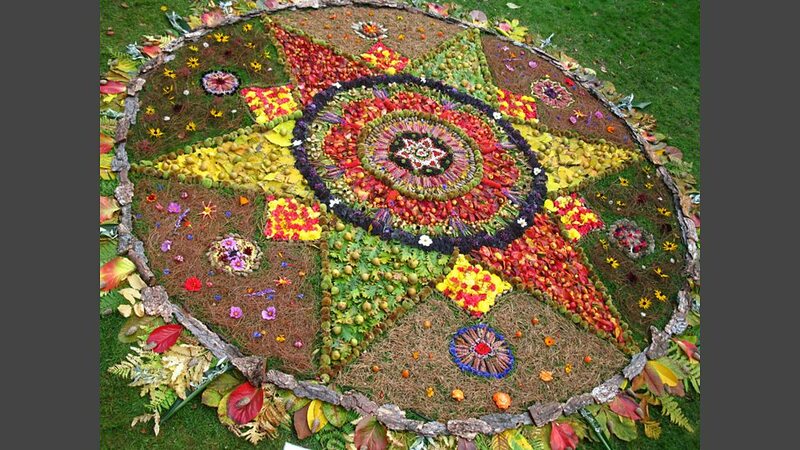 On the Traditional Count, Solstice is the day of 13 Kan~ seeding the cosmic spiral, weaving a web with our threads of celestial and terrestrial vitality. Each one of us has our own natural, indigenous connection to the core of the Earth and the core of the Sky. The Maya call this the Heart of the Heavens and the Heart of the Mother Earth. 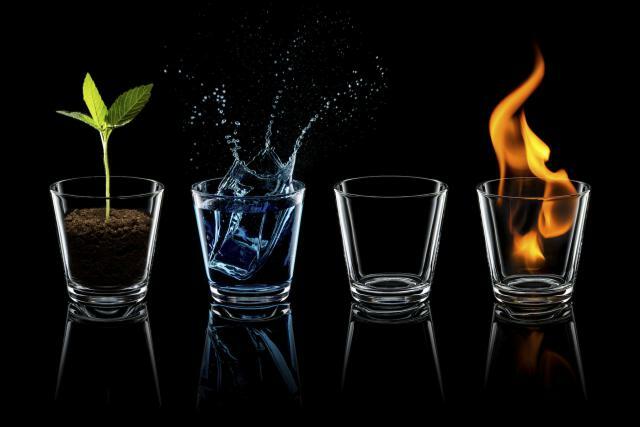 While our bodies are made of the 4 elements earth, water, fire and air, our time-travelling self is made of the 4 galactic elements: universal fire, blood, truth and sky. 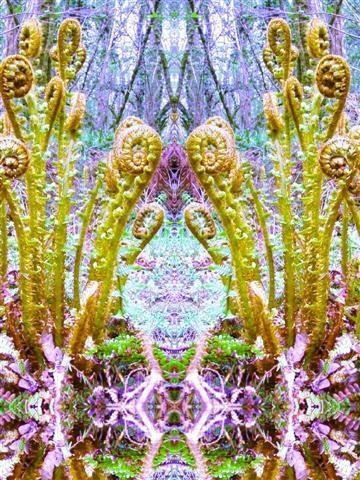 Our human work is to align with the forces of Nature. This is how we bring the higher dimensions into contact with our physical realm. As we reclaim our soul’s indigenous roots, we access deeper levels of our inner navigation channels. This is the Time of The Great Purification. The machinery of pollution is relentlessly surmounting. Is it just me, or does it sometimes feel that life is so fast-paced, accelerated, and out of balance that the Universe could possibly erupt at any moment? In these times, I feel that many of us are serving as “World Empaths,” and we need to nurture our process and be pro-active in stabilizing our own emotional natural eruptions as well. 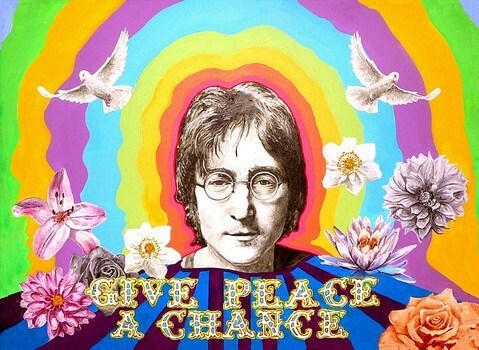 I have deep compassion for this generation of humanity right now, as we are all living in highly stressful and artificial conditions, hearing constant reports of our declining biosphere and natural resources, bombarded with broadcasts of possible future natural disasters that could destroy and annihilate our species. While being alive in these times is a privilege, it can also feel like sacred, heart-breaking torture. And yet all of the tests are here to soften our hearts, opening new paths in our minds and beings. The Light of a new awareness of our interconnectedness is calling to us all on deeper levels. 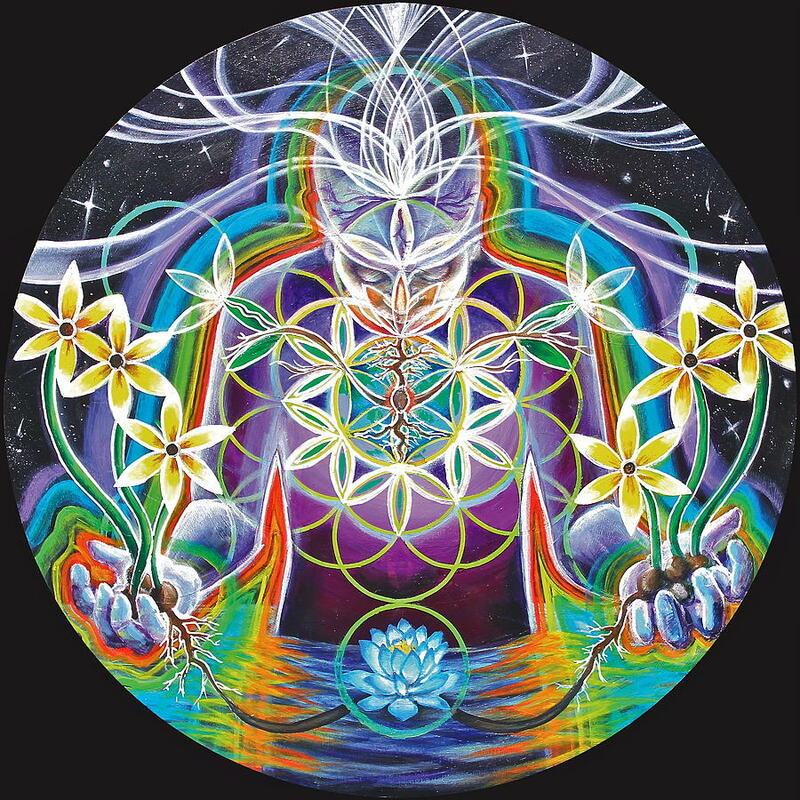 I can see the Flower of Life unfolding right now, I can feel it breathing the new world into the ethers, as time unfolds to land in the soles of our feet and the palms of our willing and humble hands. Love is Present. As the Universe challenges us in these apocalyptic times by “revealing” more and more harsh and shocking realities, how many veils are we willing to look beyond to see more facets of the fractal of our existence? In this process the Vast Love is present to embrace and absorb all, integrating the darknesses and fears into the One Empty Wholeness of Being. We are starting to collectively realize that we not only need each other, we are each other. We only judge in others what we judge in ourselves. We can never truly love ourselves while we are distracted judging and condemning our brothers and sisters. This is the time to forge alliances. To do the real work of community building and conflict resolution to get clean and clear, mindful and aligned in our relationships. 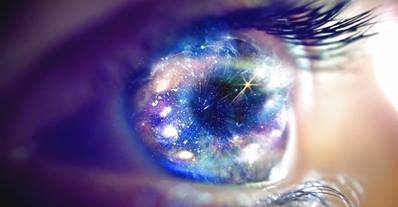 No detail escapes the magnifying glass of the Divine, nothing is insignificant, our intention counts at all times. According to the Dalai Lama, our intention directs our karma. 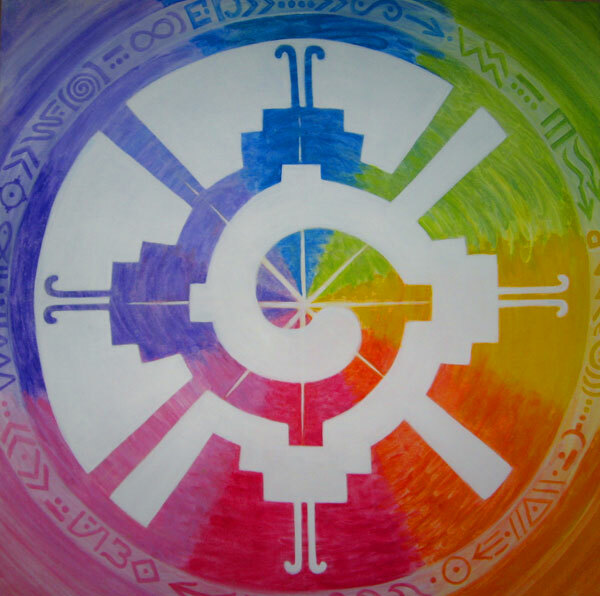 When I contemplate the prophetic voices of St. John, or The Hopi, or the Dogon, or the Q’ero Elders, or the Lakota, or the Maya, or the 13 Indigenous Grandmothers, I feel they are all sourced in the same stream of consciousness, telling us in various ways of a cycle changing; a veil of forgetting coming off and revealing remembrance. These times are asking us to become ACCOUNTABLE. We have to look inside ourselves, especially at all that we’ve denied or hid from or procrastinated towards. This is the time of exposing and cleansing. Therefore, these times are ripe for integrating one’s shadow, and it seems that’s part of what the New world is asking of us. Harmony can only be built on authentic foundations. While we are on the brink of shifting world age cycles, its not about expectations of how this will appear and unfold in the future, its about our willingness to play our roles with Heart, in this moment. These next years are sure to be bountiful with challenge, mystery, and a deepening light of remembrance, like the Solstice’s gradual Return of the Sun. What we need to accept is we can’t yank the skin off the snake’s back, it has to be shed, naturally. From a larger viewpoint we are immersed in the depths of a death, transmutation process. This is not a linearly timed process, this is pure messy chaos of real life, reflecting our own consciousness levels back at us. The more we each shed of our own unnecessary sufferings, and egoic baggage, the more energy we liberate for the collective to open to our deeper possibilities for creative human expanse. Right now, we are in the final 3 years of a particular Wave of History that’s been forming and trans-forming since the dawning of recorded civilization. As a global species, we are now thoroughly in touch with each other around the Earth. Now we need to be on the lookout to not let our external technological prowess blind us to our inner technologies. As the Earth continues undergoing rapid shifts, our purest guide is our own direct connection to the Earth and Sky. As we come to understand our human participation in the clearest light, both locally and globally, we see we are part of the one cosmic equation: Here + Now! 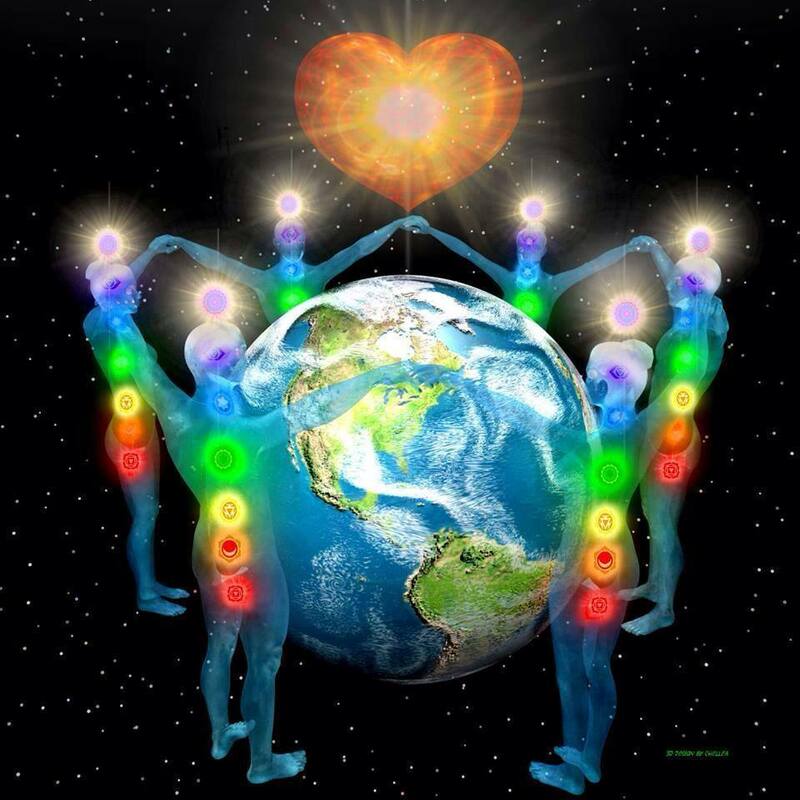 Thank you for lending your energies to join in our Solstice Synchronization! Please spread the word and stay in touch!